SETI has a jargon problem. This is not news; I think everyone in the field appreciates that we need to be more consistent in the words we use. 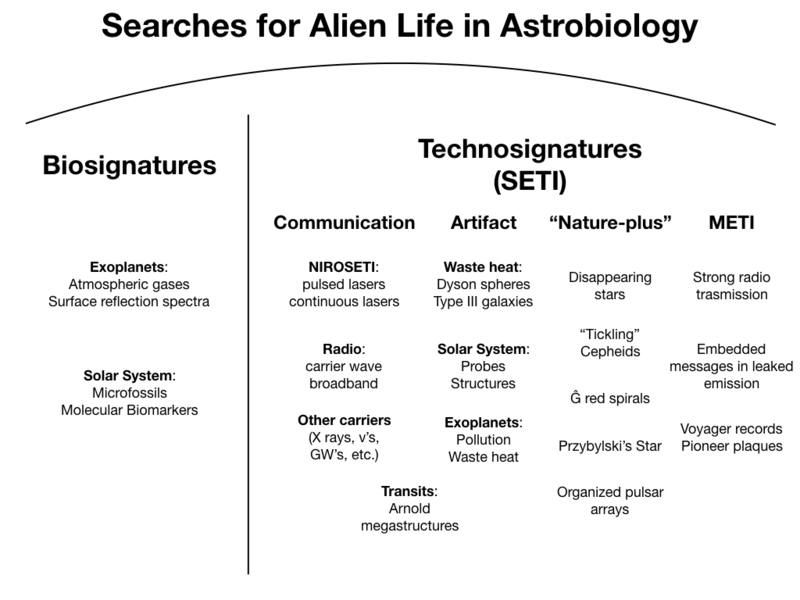 One reason this matters is that the search for alien technology is really a very broad endeavor (best thought of, I have argued, as a subfield within astrobiology). It includes not just radio astronomy but infrared astronomy, optical and NIR instrumentation, exoplanets, Earth system science, game theory, social sciences such as anthropology, galactic astrophysics, stellar astrophysics, time-domain astronomy, computer science, multi-messenger astronomy, planetary science, remote sensing, media and communications, law, and political science. These fields all have their own jargon, and if we want them to be part of SETI we should avoid misappropriating their jargon. For instance “civilization” has concrete and jargon meaning in anthropology and archaeology. I imagine anthropologists at our meetings wincing every time we use the term in a very different (vaguer, more generic) way than they do. Indeed, “intelligence” itself is problematic and not an ideal term. The term is nebulous (is an ostrich intelligent? Is a bee colony?) but also presumes much about how an alien species’ psychology works. Why shouldn’t we assume aliens will be “intelligent” or have “civilizations”? As many have noted, we should not assume that the first extraterrestrial technological species we discover is anything like us: it might not be a collective of individuals, might not be “conscious” in the way we are, might not organize itself with anything like politics, might not be animal, might not be planet-based, etc. etc. etc. Science fiction is filled with potential SETI signals of things that look nothing like “civilizations”, from Hoyle’s Black Cloud to the Borg to the Monolith. So, as part of the SETI Institute’s Decoding Alien Intelligence workshop this month and in response to Nathalie Cabrol’s call for white papers an broadening our conception of SETI, I submitted something about how we think about SETI as a field and the jargon we use. I couldn’t make it, but Penn State graduate student Sofia Sheikh went and presented the paper for me. First of all, the field needs a name. The term SETI has variously been used to refer strictly to radio searches, specific NASA programs, to any search for communication, and broader searches, and has been used both to include and to distinguish from efforts such as searches for artifacts. I agree with Almár that SETI should be the name of the entire field. One problem is that this it includes “intelligence”, which I have just argued is not a good term, but I feel that “SETI” is such a strong “brand” at this point—such a well-known and widely used term—that I think it is best to use it in a jargon sense of “whatever distinguishes technological species from other species that makes them easier to detect because of their technology”. A rebranding is very unlikely to be successful (I would support it if everyone agreed to start using a single better term). Having adopted “SETI” as the name of the field because of something like stare decisis, it follows that the term “ETI” is what we are looking for, again in a jargon sense. I also like Almár’s definition ““the collective name of a number of activities, based on science, aimed to detect messages, signals or traces” of extraterrestrial intelligence. I like to divide SETI into several classes, including communication SETI and artifact SETI, being the searches for deliberately transmitted information carriers and the effect of technology on the environment. Other terms for the latter abound (technomarkers, Dysonian SETI, SETA…) and we should settle on one. Within artifact SETI then there are lots of ways of searching: waste-heat SETI, probe SETI, Solar System SETI, and so on. METI or active-SETI would also then constitute a subclass of SETI. Paul Davies coined the term “nature-plus” which is the best term I’ve seen to describe the idea that alien technology could be so advanced that it will look like a force of nature; this could include contamination of stellar abundances, artificially modulated Cepheid variable stars, or even something like Hoyle’s Black Cloud. It’s not exactly what Davies intended, but its the best label I could find for this kind of search. Finally, I think it’s important to define a beacon as a signal or artifact meant to be discovered by strangers. The term has been used in other ways, but this is the term’s most natural meaning, and helps us identify which sorts of signal searches can be informed by the concept of a Schelling point. The latter term has many many names in the filed (“strategy of mutual search”, “convergent search strategies,” “attractor for SETI”, “synchrosignals”) generated as people rediscover Schelling’s insight, but we should honor game theory’s prior art here and recognize the value of needing to think about assumptions of common knowledge that we make when looking for “magic frequencies” and such. Finally, we should avoid terms like “colonize” and “alien race” because of the social baggage they bring along. (This is not because I think we should be PC, but because we should be precise: if you really do mean to project our notions of colonization and race onto alien species with whom we share no evolutionary descent, much less culture, then by all means use those terms). So that’s my reasoning and set of preferences for jargon, but I recognize this needs to be a collective decision in the community, and I suspect that the final answer will arise collectively and organically, and not by fiat. Already we’ve received good feedback (CETI is probably its own category, distinct from METI, as Jill Tarter pointed out; “artificial” is a difficult and probably problematic term we should define better, as Frank Drake has pointed out). Anyway, I think Sofia’s presentation will be public at some point, and the paper is available here at the conference website, and an updated version with the figure below is on the arXiv here. This entry was posted in Uncategorized on March 18, 2018 by jtw13. ‘Oumuamua’ – Oumuamua is a small object, estimated to be about 230 by 35 meters (800 ft × 100 ft) in size. It has a dark red color, similar to objects in the outer Solar System. Oumuamua showed no signs of a comet tail despite its close approach to the Sun, but has since undergone non-gravitational acceleration consistent with comet outgassing. It has significant elongation and rotation rate, so it is thought to be metal-rich with a relatively high density. Oumuamua is tumbling, rather than smoothly rotating, and is moving so fast relative to the Sun that there is no chance it originated in the Solar System. It also means that Oumuamua cannot be captured into a solar orbit, so it will eventually leave the Solar System and resume traveling through interstellar space. Oumuamua’s system of origin and the amount of time it has spent traveling amongst the stars are unknown. Since Oumuamua is a comet that is not able to be caught in a solar orbit because it is moving so fast fast relative to the sun, could the object that impacted Earth and is thought to have caused the extinction of the dinosaurs along with it origins not being known be part of a train of exo-solar objects from another region of the galaxy be responsible for extinguishing life on Mars and changing the environment on Earth forever? In the video the size of the asteroid that impacted Earth is thought to have been larger than Mt. Everest. An object that large could possibly generate its own gravity field or at least cause widespread impact events as it crashed through the rings around Saturn or Jupiter causing other meteors and asteroids to pummel the planets in the habitable zone. As the Dino Killer traveled from its point of origin could it have had smaller bits of debris that impacted planets as far out as Gliese 317 that caused extinction level events which could be the reason why we haven’t discovered any life within 50 ly of Earth yet? Could Oumuamua be a comet that was dislodged from the Oort Cloud and was effected in such a manner that the impact from the Dino Killer asteroid sent it on an end over end tumble in the direction of Earth? But more importantly, does Oumuamua pave the way for an extinction event theory where a large swarm of asteroids as big as Mount Everest traveled through the Sol system region and caused extinction level events as far out as 50 ly? Could Earth have been lucky and avoided larger asteroids that killed off life completely on the planets that have been discovered thus far? Since Earth, Mars and some of the planets orbiting the gas giants of Jupiter and Saturn have been discovered with having water on them I am convinced that a lot of water would have formed on planets within 50 ly of Earth…if….if those suns that have planets in orbit around them are relatively the same age as our own Sun. The blood types of humans on Earth -A Premise for Planets Capable of Supporting Life In the Universe. If life on Earth was designed or destined to remain on Earth then why are there so many different blood types? Could each blood type have evolved from a point in the evolution of humanity when oxygen and carbon dioxide levels in the atmosphere were different, each blood type being able to exist in a variable state of oxygen to carbon dioxide environment as the Earth grew and finally emerged into the form that it is today? But why would Life want to create such a diversity of blood types that would have adapted to various levels of oxygen and carbon dioxide? The only result that I can think of is that each blood type would be able to survive on a planet with lower oxygen and carbon dioxide levels once a male and female conceived a new born on the planet. Its much like saying that only certain blood types can donate to each other otherwise you can get sick and die from a foreign blood type. But there are bridge blood types that exist that other blood types can use without any problems even though the two blood types are different. After the Big Bang there would have been thousands if hundreds of thousands of habitable worlds in our galaxy, each with a variable amount of oxygen and carbon dioxide levels based on different levels of hydrogen, carbon and oxygen being present. Levels that might be suited for one blood type but not another blood type. I think of life existing in the Universe like an explosion. Either the Big Bang was an explosion or simply a rapid expansion of matter without an explosion. In both cases an explosion is much like and expansion. Prior to an explosion or expansion all matter containing the ingredients of life would have been relatively close to each other packed very densely together, much like the material composite of the structure of an artillery shell. The shell or the components of life are sent hurtling through space and then impact the ground or a form of matter that causes the shell to explode. As the shell explodes the same material the is present in its metallic composition is sent flying in all directions. Each fragment interacts with the air based on the shape of the artillery piece causing dynamic air flow and changes that sends causes different trajectories for each shell piece. But based on the conversation of energy each shell piece would land within a determined range from the initial point of impact. Life in the Universe would exist in much the same way. The material that life was made from during the Big Bang would have expanded in the same direction at faster than the speed of light. Before there was gravity created by suns and planets and other celestial bodies, Quantum gravity must have been present. When Quantum gravity interacted with the expanding life material it caused the material to part ways in different directions but still allowed for the same life material composition to remain in small clusters that like the artillery shell pieces would have landed within range each other and from within a range of the initial point at which Quantum gravity and gravity interacted to create a barrier that slowed the otherwise faster than light speed expansion down. That’s the best I can way that I can describe how life would be present in the Universe. What we could be seeing taking place in KIC 8462852’s solar system is not an advanced life form….but the formation of life taking place. Life forming in a solar system has never before been seen or witnessed. But according to NASA, 92% of planets that are habitable have yet to come. Life forming in a solar would therefore create a lot of odd occurrences to say the least as the elements combined in such a way that would effect the suns output or its light curve as a whole. The solar systems that are unique and have odd light curve values similar to KIC 8462 that are not understood could be explained as potentially being solar systems where life is forming and slowly taking hold. We know that life exists on Earth. Would it be so illogical that planets close to Earth might also have encountered the same circumstances that sparked life on Earth but took slightly longer to do so? Think of a camp fire and a log. One point on the log will catch fire, this is the point at which life came to be on Earth, then slowly through the transfer of energy to the rest of the log, the log catches fire. A Premise For Life Existing In The Universe Outside of Earth. There has been a lot of discussions about Tabby’s Star being influenced by a Dyson Sphere or Dyson Swarm. With Tabby’s being 1,275 light years from Earth, determining that an artificial source, such as a Dyson Sphere, could be responsible for the fluctuation in a light Sun’s light curve is a “best guess possible” scenario. But..but if we look at Earth’s own technological advancements over the course of thousands of years that culminates with space exploration we can see that there are two elements that have been critical to Earth’s technological and advancements that have built a stairway into the unknowns of space. Those two elements are gold and copper. Silver has the best thermal conductivity and highest light reflectance value, but copper and gold have a higher corrosion resistance value compared to silver. But why is gold a better conductor? The electrons in gold have less resistance and can move more easily. The level of resistance is caused mainly by the amount of energy that is needed for electrons to detach from their valence state (fixed state of electron, close to proton) to their conductive state (able to move freely). If the energy needed for electrons to detach is low, more electrons are in their conductive state, making this metal a better conductor of electricity. At the base of the Kardashev Scale is the type I Civlization – A Type I designation is a given to species who have been able to harness all the energy that is available from a neighboring star, gathering and storing it to meet the energy demands of a growing population. This means that we would need to boost our current energy production over 100,000 times to reach this status. However, being able to harness all Earth’s energy would also mean that we could have control over all natural forces. Human beings could control volcanoes, the weather, and even earthquakes! (At least, that is the idea.) These kinds of feats are hard to believe, but compared to the advances that may still be to come, these are just basic and primitive levels of control (it’s absolutely nothing compared to the capabilities of societies with higher rankings). A Type I Civilization would have discovered that gold and copper are the best conductors to use in any technological component meant to transmit a set of orders to another component in their attempts to harness the energy from their sun. The simplest component transmission would be from a computer to a servo that is used to position a solar array panel to collect the energy from the sun at all angles. Therefore a solar system that is being considered a likely candidate for a potential Type I civilization should first have its gold filament volume established. A gold filament volume is the amount of gold that can be detected in orbit around the sun being scanned. Since gold is created in super nova that then releases the gold into the surrounding region, a region must be determined to have had a super nova event in its past. A super nova event in the regions past would distribute enough gold to the surrounding systems and evolving planets to allow for advanced components to be developed. Advanced components that would need the best source of conductive elements in order to transmit and process orders at the fastest possible speeds possible. The faster a computer is able to transmit it’s communications the faster that an order is received and the end process achieved. Time and efficiency if you will. Copper is a second best conductor to gold but a second best is not good enough for the rigors of space travel and harvesting energy from the sun and establishing colonies away from the home planet. Copper would allow for advanced civilizations, but without gold the Type I civilization would most likely be confined to their own planet or planets such as Mars or the Moon that are relatively close to each other. A region that has a high gold particle content would be a system that would be justified as having the potential to support a Type I Civilization. If a large quantity of gold is found in the region then most likely other metals such as lead, zinc, silver and copper will also be found on rocky planets within a solar system. If the gold levels of KIC 8462852’s solar system or other scanned solar system can be determined to be comparable to the levels of gold in our own solar system then the scanned solar system is more likely to be a potential for a habital planet or a solar system that has a Type I civilization with life already in the system. As a writing instructor for the natural sciences, I found this post to illustrate the epistemic nature of jargon. That’s important so that things don’t have their name change when we find new stars or learn they’re unbound, as here! Dr Wright: Thanks for the reply, however,this confuses me even more. I thought that “A” and “B” designations were used ONLY when the two stars were actually a binary SYSTEM, and not a visual binary, which appears to be the case. Of course, I am unfamiliar with the Kepler KIC protocol, so I guess it could still be appropriate. I think KIC 8462582 B is a fine and appropriate name for it. The stars that deserve eponyms are those that get them organically. I pushed for “Boyajian’s Star” because I was seeing “WTF” and “Tabby’s Star” popping up in the professional literature, where such informal terms don’t belong. It was clear that astronomers were striving to use a more mnemonic name, so I pointed out that we have a rare but well-established way for that to happen and worked to plow that row. If this faint star ends up getting called something other than KIC 8462582 B all the time, then perhaps we can talk about an eponym. But certainly it shouldn’t be me. How would a post-biological intelligence be included in astrobiology? As astropostbiology? Dr Wright: Speaking of “jargon”, since Boyajian’s Star’s “companion” now appears to be separate entity in its own right, if it is proven in the future that a face-on Kuiper belt of uneven composition orbiting it is the cause of the flux variations of Boyajian’s Star(assuming that it IS a FOREGROUND star), it may be deserving of a “name” as well. Would Wright’s Star be appropriate, since you were part of the team that discovered it while observing Boyajian’s Star, or would Clemens’ Star be more appropriate, since his team discovered the true nature of the star?